The New York Knicks beat the Los Angeles Lakers, 113-109, in overtime on Tuesday night. The game thrilled fans, with both teams’ young and upcoming players showing off their potential in a back-and-forth affair. The game gave the NBA reason to be excited, as its two marquee teams in the two biggest media markets look to have promising futures. 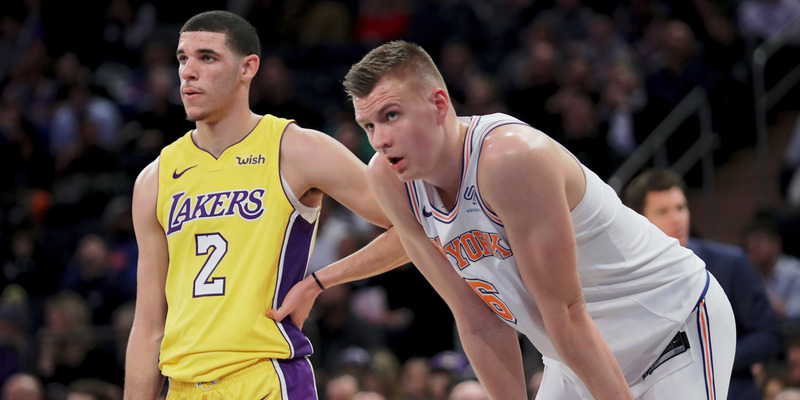 The New York Knicks beat the Los Angeles Lakers, 113-109, in overtime in an exciting, primetime matchup that showcased both teams’ considerable young talent. The game was exactly what the NBA wanted: a nationally televised game between two of its marquee franchises, with both teams surprisingly competitive and stocked with young, intriguing talent. Madison Square Garden was abuzz at seeing the Lakers, rookie Lonzo Ball, and the travelling Ball family circus (sitting courtside for the game), and they did not fail to deliver. One stretch in particular showed off the promising futures of both teams. Ball, who has struggled for much of his rookie season, seemed to catch fire after throwing down a big alley-oop dunk in the third quarter. The dunk ignited a run by both teams, among the most entertaining stretch of basketball either team has seen this season. Kristaps Porzingis, the Knicks’ 22-year-old, 7-foot-3 star, answered back with a three of his own. Ball was cooking, though. After a deep catch-and-shoot three, he then blew by Knicks center Enes Kanter for a nifty lefty layup, drawing oohs-and-ahhs from the crowd and prompting celebration from LaVar. Kanter, who has become a fan-favourite for his confrontation with LeBron James, answered, too, with two baskets in the paint in the middle of Ball’s run. After Ball penetrated and kicked the ball out to Brook Lopez for a three, Porzingis bookended the run with another three. Over the course of two minutes, the two teams combined for 20 points and six assists. It wasn’t just Ball and Porzingis showing off, however. For all of Ball’s excellence in the third quarter, finishing with 10 points and 2 assists in the frame, Knicks rookie point guard Frank Ntilikina, selected six spots behind Ball in the 2017 draft, answered with a big fourth quarter. The 19-year-old rookie, who has shown immense upside but remains fairly raw at the moment, found a stroke of confidence. Ntilikina answered Ball with a 7-point, 4-assist fourth quarter in which he threw no-look pick-and-roll passes. And after taking Ball off the dribble for two pull-up jumpers, Ntilikina then buried a three-pointer from Stephen Curry range. The three players finished with robust stat lines, none bigger than Porzingis, whose 35 points, 11 rebounds, 5 three-pointers, and 5 blocks has never been achieved in NBA history, per Basketball-Reference. Ball, meanwhile, finished with 17-8-6, while Ntilikina’s 13 points were a career-high to go with his 5 rebounds and 5 assists. The Knicks and Lakers’ growth has been modest. The Knicks, at 14-13, are tied for sixth in the Eastern Conference. The Lakers, at 10-16, are fading, but did not enter the season with high expectations. But it’s reason for the NBA to be excited, to have two teams in the biggest media markets thriving and bringing excitement back to their respective arenas.